A few months ago Johnny Marr mentioned he was planning on releasing a live album and now he's proved that he'll make good on that promise! 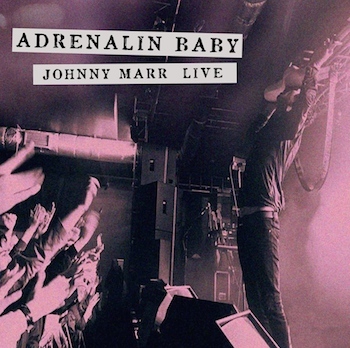 Marr announced details for his very first live album titled Adrenalin Baby. The double album (go big or go home!) was captured live over the span of three years while Marr was promoting his solo albums The Messenger and Playland. The tracklist looks pretty strong -- besides the singles from his two albums, he's included performances of Smiths' classics such as "There Is A Light That Never Goes Out" and "Bigmouth Strikes Again," plus Electronic's anthem "Getting Away With It."